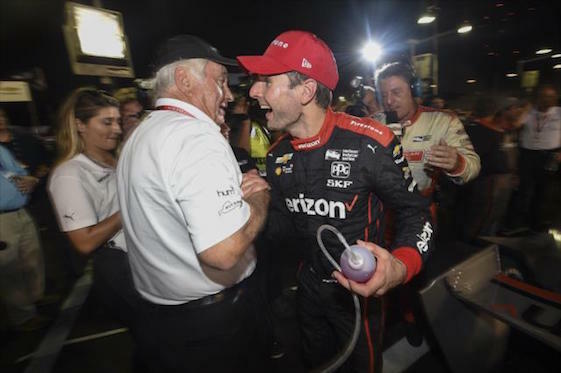 Will Power went from worst-to-first at Gateway Motorsports Park in the span of a year Saturday night, and in the process, inched closer into contention for the 2018 Verizon IndyCar Series championship. Charging from the start, Power took control over the final 100 laps of the Bommarito Automotive Group 500 presented by Axalta and Valvoline to record his third win of the season. Power guided the No. 12 Team Penske Chevrolet across the finish line 1.3117-seconds ahead of Alexander Rossi for the 35th victory of his career, tying Bobby Unser for seventh most in Indy car history. The win came one year after Power completed just five laps at the facility in Madison, Ill., outside St. Louis, before a crash ended his night and title hopes. This victory lifted the 2014 Verizon IndyCar Series champion to third in the standings and within 68 points of leader Scott Dixon, who finished third after starting on-pole via entrant points. With his third straight podium finish following a pair of wins, Rossi maintained second in the championship and moved to within 26 points of Dixon with two races remaining. Power passed Dixon for first place on Lap 150 of 248. The 37-year-old Australian then opened a gap of more than seven seconds before making his final pit stop for a splash of ethanol 18 laps from the end, surrendering the lead to Dixon. Power regained the lead on Lap 240 after Dixon and other drivers made their last stops for fuel. Rossi, attempting to complete the race in one less pit stop _ as he did in winning the 2016 Indy 500 and four weeks ago at Mid-Ohio Sports Car Course _ nursed his No. 27 Honda home in second place for his eighth podium finish of 2018. “It’s a mental game because you’re trying to obviously hit a fuel (mileage) number to go X-amount of laps, and it was a very, very big fuel number,” said Rossi, of Andretti Autosport. “Unlike the (Indy) 500 in 2016, I didn’t have a teammate (Townsend Bell) to tote me around so I had to figure out how to do it myself, which was a big challenge. With the victory, Power joined Dixon, Rossi and reigning series champion Josef Newgarden as three-time winners this season. Power swept the May races at Indianapolis Motor Speedway _ the INDYCAR Grand Prix on the road-course and 102nd Indianapolis 500 on the famed oval _ but Saturday’s win was his first with team-owner Roger Penske calling the race strategy. Dixon led 145 laps from pole position in the No. 9 Chip Ganassi Racing Honda and earned his eighth top-three result of 2018. The four-time series champion has watched his lead shrink from 62 to 26 points over the past three races, despite finishing in the top-five each time. Newgarden, the Gateway winner last summer, finished seventh and fell to fourth in the standings, 78 points behind Dixon. “Tough night. We kept in it, we tried to make the most of it,” said Newgarden, driver of the No. 1 Team Penske Chevrolet. “We just lost too many positions there at the end. The whole race long, we just didn’t get the timing right. We got caught-out in a couple of different times. Will got stuck up in the gray and we lost some speed when we caught him and lost a couple of spots there. We tried to make a fuel number there at the end and it ended up biting us. Ryan Hunter-Reay, the 2012 series champion, finished 20th when mechanical issues parked his No. 28 Honda after 172 laps. At 147 points behind Dixon, Hunter-Reay is fifth in the standings and the only other driver with a mathematical chance to win the championship. While unable to overtake Power in the final laps, the podium finishes by Rossi and Dixon were more than enough for Honda to clinch the Manufacturers’ title over Chevrolet with two races remaining. Next on the schedule is the Grand Prix of Portland on Sept. 2, marking Indy car racing’s return to Portland International Raceway in Oregon for the first time since 2007. The race will air live on NBC Sports Network at 2:30 p.m. (EDT) and the Advance Auto Parts INDYCAR Radio Network. On Saturday, Wickens reportedly was breathing unaided and speaking with members of his family. Surgeries were performed late this week on his right arm and lower extremities without complication. The extent of his spinal cord injury remains indeterminate. Wickens also underwent a series of precautionary tests that found no indication of further injury. A 29-year-old Canadian and series rookie, Wickens was injured in a violent multiple-car crash on Lap 7 of the ABC Supply 500 on Pocono’s 2.5-mile “Tricky Triangle” layout in Long Pond, Pa. Future treatment for Wickens includes more corrective surgery and rehabilitation. All 21 cars competing in Saturday night’s Bommarito Automotive Group 500 presented by Axalta and Valvoline at Gateway Motorsports Park in Madison, Ill., sported decals wishing Wickens a speedy and strong recovery. Ryan Norman passed teammate Colton Herta six laps from the finish at Gateway Motorsports Park and drove on to his first Indy Lights presented by Cooper Tires victory following a late-race duel. Point-leader Patricio O’Ward finished third in the 75-lap race run without a caution period to give Andretti Autosport a podium sweep. O’Ward will take a 25-point lead over Herta into the doubleheader finale weekend at Portland International Raceway from Aug. 31-Sept. 2. In the Pro Mazda Championship presented by Cooper Tires, Rinus VeeKay (Juncos Racing) drove to his fifth consecutive victory and edged closer to clinching the 2018 championship. VeeKay holds a nearly insurmountable 47-point lead over Parker Thompson (Exclusive Autosport) with only the Portland doubleheader remaining. Verizon IndyCar Series point standings: Dixon 568, Rossi 542, Power 500, Newgarden 490, Hunter-Reay 421, Pagenaud 400, Wickens 391, Rahal 371, Hinchcliffe 353, Bourdais 334.